Videos on this page cover the specific techniques and processes that students will use in both Printmaking I & II courses. Check your syllabus for which video needs to be viewed by which class day. Students will be quizzed over the content of the videos prior to beginning work on a new method or process. Linoleum Reduction Printing - the designing, carving, and printing process for 4 separate 5 color prints. Click on the above image to download the PDF Etching Guide discussed in the video. 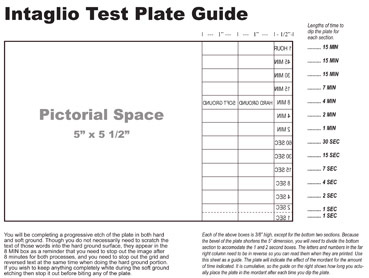 It will help you know what lengths of time to bite your copper plate.